I was making my favorite but usual Butternut and Dried Cranberry side dish last night. I don't know about you but I'm starting to come down with a case of the winter blues so I decided to give my squash a summer spin by adding canned pineapples and almonds for crunch. Fantastic! 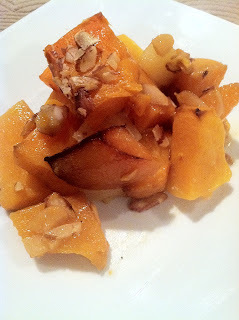 The pineapples caramelized beautifully with the squash and the crunchy almonds just took my dish to the next level. This is a great recipe to try out when you're snowed in or just looking to add a twist. Why is the cubed squash still not soft after complete cooking time? Hey Anonymous, You don't want the squash to be too mushy it should still be slightly firm. Are you covering the casserole dish? Everyone loves this recipe and I take it to church every so often, too!! !